This menu is use for Thai Vegetarian and Thai dessert. It’s easy yourself for cooking at home. You can this menu in Kin-Jay festival. 1. 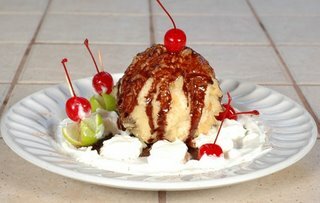 Scoop out ice-cream into balls the size of a golf ball.Dip in flour, then beaten egg, then roll in breadcrumbs and dessicated coconut mixed together. 2. Place balls on a tray and return to freezer until hard. 3. Repeat dipping process and return to freezer until hard again. 4. Heat oil and drop ice-cream balls in a couple at a time. Deep fry for just a minute until golden. Serve with caramel sauce, shredded coconut and passionfuit on top. 1. place sugar and 1/2 cup water in a saucepan and stir over moderate heat until sugar dissolves then boil without stirring until syrup turns golden. 2. Remove from heat and carefully pour in cream.Rturn to heat and stir until smooth. Have a nice for cooking yourself vegetarian dessert. Serve with; cherry and whipcream.